Viejas Arena is a facility that is compliant with the Americans with Disabilities Act (ADA), and the staff takes a great effort to make accommodations for our disabled guests. Please visit our Disabled Services A-Z Guide for further information. The box office is located on the 55th Street, in front of Viejas Arena. Viejas Arena is an all ages venue. Please visit Children’s Entry for more information. The local airport in San Diego is San Diego International Airport (SAN), roughly 13 miles southwest of Viejas Arena. To get to Viejas Arena, access I-5 North to I-8 East. For further directions, please visit our Parking & Directions page. For safety purposes, all aisles must remain clear during events – no lingering or dancing allowed in the aisles. Alcohol service varies depending on the event. Alcohol is served at most concerts and basketball games. Please visit our Concessions page for a list of beverages. Any restriction will be clearly noted on the events website listing. There is an ATM located outside Gate 2 next the the box office windows. Large backpacks and bags are not permitted into the facility. However, any items – bag included – needed to take care of a baby will be allowed under security guard’s discretion, and all items are subject to search. Baby changing stations are located on the upper level in both the Men and Women’s bathrooms next to Door 2, and on the Floor Level. There is an additional station located in the women’s restroom outside of Door 6. Given existing security concerns and in an effort to expedite guest entry, we ask that you consider not bringing a bag to events at Viejas Arena. In addition, please arrive early and be patient as we work to ensure a safe environment. If you must bring a bag, it can be no larger than 16"x 8" x 16". No backpacks allowed. All bags are subject to search prior to entrance and inside the facility. Banners, posters, and signs must be no larger than 20’’ x 20’’. All items are subject to content review – obscene and/or vulgar messages will not be allowed. Bicycle racks are located outside our main entrance at Gate 2. Guests are responsible for bringing their own locks and locking up their bikes properly. Viejas Arena is not liable for any lost or stolen property. Binoculars are allowed in Viejas Arena for most events. Please contact the Viejas Arena management office to inquire about booking Viejas Arena. The Viejas Arena box office is located next to our main entrance at Gate 2, and can be accessed off of 55th Street. Hours may vary depending on events and on-sales. Closed most holidays (except on event days). For further box office and ticketing information, please visit our Ticket A-Z Guide. For Aztec basketball games, non-professional point-and-shoot/still cameras are allowed. Professional cameras – any with a detachable lens – and video cameras will not be allowed in. For concerts and other events, the camera policy varies depending on the event. Any restriction will be clearly noted on the events website listing. Children two (2) years and younger will be admitted free and must sit on a ticket holder's lap. All children 3 years of age and older need a ticket to attend. Visit the Athletics website goaztecs.com for information on Aztec ticket promotions. For entertainment events, Viejas holds a "babes in arms" policy - any child who is old enough to walk will need a ticket to attend. Those children entering without a ticket will sit in an adult's lap. For select events, every person (regardless of age) must have a ticket to attend. Any age restriction will be clearly noted on the website listing. Is this event appropriate for my child? If you wish to bring children, we encourage you to use parental discretion and consider bringing ear protection. We are not responsible for artist content and we are unable to issue refunds if guardians find content objectionable. Please visit our Code of Conduct page for full details. There are concession stands located on the upper concourse – both inner and outer – and on the floor level. Visit our Concessions page for a list of menu items. Viejas Arena and San Diego State University is located within a surrounding residential area. Out of courtesy to our neighbors, all events at Viejas Arena have an 11 pm curfew. Viejas is located on the San Diego State University campus at 5500 Canyon Crest Drive, San Diego, CA 92182. For directions and parking information, please visit our Parking & Directions page. For detailed information regarding our disabled services, please visit our Disabled Services A-Z Guide. No distribution, sales, or solicitation is allowed in or on the Viejas Arena premises without prior written approval from Viejas Arena. Non-commercial distribution or solicitation outside of Viejas Arena premises is subject to all San Diego State University policies and may not impede the free flow of foot traffic, vehicle traffic, or block doorways, walkways, corridors, or fire lanes. Sales or distribution of commercial items is not allowed on Viejas Arena premises or outside Viejas Arena premises without proper permitting. Guests must maintain appropriate behavior at all times. Guests engaging in disorderly conduct or using offensive language may be ejected from the facility and may be subject to arrest. There will be no refund or compensation for ejected guests. Depending on the event, gates/doors typically open 60 to 90 minutes prior to the show start or tip-off of each event. Please call our management office to verify times for the event you plan to attend. All guests must wear appropriate clothing to enter the facility. Clothing with crude language will not be allowed. Shirts and shoes are always required. We reserve the right to deny entry to anyone who does not comply with our dress code. For the safety and privacy of our guests, spectators, tenants, promoters and property, the use or flying of drones in and over our airspace, parking lots, and roadways without prior approval is strictly prohibited and is subject to federal penalties. The drop-off zone is located in front of our main entrance at Gate 2 off of 55th Street, and can be accessed from Aztec Walk. Parking is not permitted in this area. Trained staff and security will ensure the security and safety of all guests, performers, and employees. In the case of an emergency, guests must comply with requests from venue staff regarding arena operations and emergency response procedures. To reach somebody attending an event at Viejas Arena (in the case of an emergency ONLY) please call our management office at (619) 594-0234. It is imperative that the caller has the exact seat location including section, row, and seat number of person whose attention is required. We will gladly take a message to them. Without a seat location, it could be impossible to locate the person as we are unable to make PA announcements during events. Viejas Arena is a department of Associated Students of San Diego State University. Please visit the A.S. Jobs website to view job postings. Gate 2, Gate 3, and the VIP/Customer Service Gate typically open an hour before the start of an event. The VIP/Customer Service Gate and Gate 2, which are located at our main entrance off 55th Street, remain open for the entire duration of the event. For concerts with general admission floor, Gate 1 will be open for those with GA floor tickets. Those guests must enter Gate 1 to receive a wristband. All guests are subject to search before entering the facility. Please see our Prohibited Items list for items that will not be allowed into the arena. There is a family restroom located on the bottom floor of Viejas Arena. To be escorted to the floor, please contact a staff member. Baby changing stations can be found on the upper concourse, next to Door 2 - in both the men’s and women’s bathrooms - and in the women’s restroom by door 6. The staff at Viejas Arena wants to make your visit as enjoyable as possible. To give us feedback, please Contact the Viejas Arena management office by phone or e-mail. First Aid is located on the First floor (arena floor level) adjacent to the passenger elevator. A family restroom is available in the First Aid room. Paramedics are on-site for most events. For most events, outside food in soft containers is allowed into the facility. Outside drinks are not permitted, with the exception of 20 oz. sealed water. Food and beverage policies may differ between events. Please contact the Viejas Arena management office to inquire about a specific event. The concession stands at Viejas Arena are operated through Aztec Shops. Please see the Concessions section for further information. For any guest services needs during an event, please go to Guest Services at the VIP/Pass Gate entrance adjacent to the box office. San Diego offers a multitude of accommodations close to Viejas Arena and the San Diego State campus. Please visit our Hotels page for a list of some of the nearest locations. * Hours will be added to serve guests during events. * Closed most holidays (except on event days). Please contact any Viejas Arena staff with housekeeping needs or concerns during an event. Please contact any Viejas Arena employee or Elite staff in the case of a lost child. Staff members are unable to make PA announcements during events, but will be able to alert all staff to help locate the child. During events, please go to the VIP/Pass Gate to inquire about lost items or to turn in any found items. Any other time, please call the management office. Please call as soon as possible – all items are subject to removal a month after the event in which it was found. Merchandise stands can be found on the outer concourse, and can typically be seen upon entry to the facility. The Viejas Arena management office is open Monday through Friday, from 8am to 4:30pm. For contact information, please visit our Contact Us page. For box office information, please visit our Ticket A-Z Guide. Designated parking for events at Viejas Arena is in Parking 12 and Parking 7. Please visit our Parking & Directions page for further information. Large bag and Backpacks larger than 16" x 8" x 16"
Property check-in is offered for most events, and is located directly across from Gate 2. Viejas Arena cannot be held liable for any lost or stolen items that are checked in. Please put your name, phone number and seat location on the tag to be tied to your property, and please be sure to pick up your items upon leaving the event. Items left will not be mailed. Viejas Arena is located on the San Diego State campus, where there is an MTS bus and trolley station roughly a quarter mile east from the facility. The SDSU trolley station lies on the Green Line that runs east and west. 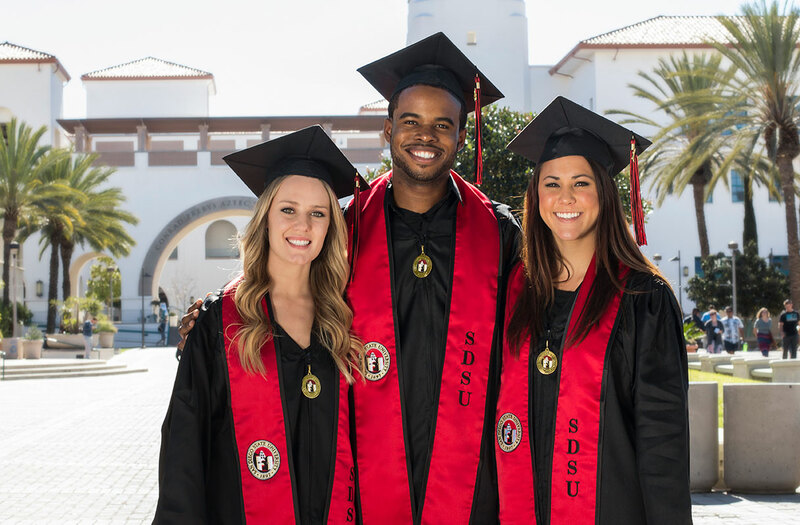 Visit the MTS website for further details, and visit our Parking & Directions page for directions from the SDSU MTS station to Viejas Arena. Re-entry is typically not allowed during events. For information regarding a specific event, please contact the Viejas Arena management office. Typically, recording devices are not allowed into Viejas Arena. There are some exceptions for select events. There are never recording devices allowed for concerts or Aztec basketball games. There are restrooms available to guests on the top level outer concourse. Restrooms are available to those with floor tickets on the floor level, by the concession stands. Any seat cushions without a rigid (e.g. metal or plastic) post will be permitted into Viejas Arena. Any guests with cushions or back supports with a rigid post will be asked to return it to their car or keep it in property check-in. The dimensions of the seats in Viejas Arena are 18’’x22’’. All guests are subject to a security screening before entering the facility. Viejas Arena is a facility of San Diego State University. As of January 2014, there is no smoking of any kind permitted on the SDSU campus. There is no smoking allowed within the Viejas Arena gates, which includes the use of electronic cigarettes and vaping devices. Please visit SDSU Smoking Policy Page for further details. Viejas Arena has held a variety of special events, from conventions to exams to private parties. Please contact the Viejas Arena management office to inquire about renting the facility. In keeping with the University’s policy of nondiscrimination on the basis of gender identity and gender expression, Viejas Arena supports and values an individual’s right to access and utilize facilities, programs, restrooms and services in accordance with an individual’s gender identity and gender expression. Strollers are not permitted inside Viejas Arena. There is no tailgating of any kind allowed at Viejas Arena or in the surrounding areas. Tickets can be purchased at the Viejas Arena box office in person, or through Ticketmaster online. Customers can avoid the Ticketmaster service fee by coming directly to the Viejas Arena box office for their ticket purchases. However, they may be subject to a smaller service fee. For events when umbrellas are allowed, all umbrellas need to be collapsible down to 20" or less. Any violation of arena policies or state/local laws may result in ejection, fines, and/or prosecution to the fullest extent of the law. Violators may be barred from future events. Water is served at all of the concession stands. Drinking fountains can be found on the inner concourse on the top level.